Oman has no official diplomatic ties with Israel. Following the signing of the Oslo Accords, however, relations with several of the Gulf states improved, some more overtly than others. Yitzhak Rabin was the first prime minister to visit Oman in 1994. In 1996, his successor, Shimon Peres, met with the sultan. Oman’s foreign minister visited Israel in 1995. Following the collapse of the Oslo negotiations at the end of the 1990s, relations cooled again although Foreign Minister Tzipi Livni did meet with her Omani counterpart in 2008. 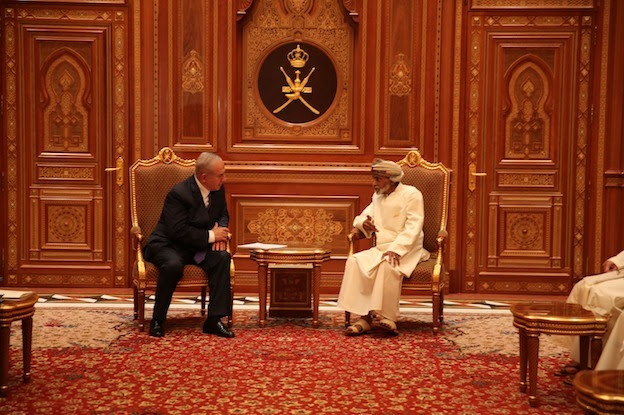 In a surprise announcement, the government reported that Prime Minister Benjamin Netanyahu made an official visit to Oman and met with Sultan Qaboos Bin Said on October 26, 2018. The Prime Minister’s Office said the two sides discussed ways to achieve “peace and stability in the Middle East,” adding that “the prime minister’s visit is a significant step in implementing the policy outlined by Prime Minister Netanyahu on deepening relations with the states of the region while leveraging Israel’s advantages in security, technology and economic matters." In another positive sign, Netanyahu later announced Oman will open its airspace to El Al. “Israel Says Oman Will Open Its Airspace to Israeli Carrier,” Associated Press, (December 10, 2018).